Blender 2.79 was finally released a day ago after 2 release candidates. Here’s how to install it in Ubuntu 14.04, Ubuntu 16.04, Ubuntu 17.04, and derivatives. OpenCL support has improved and should be closer to parity with Blender’s CUDA capabilities. For third-party binaries, Blender is also available via Snap and traditional PPA. You can install both or either one via following steps. Blender 2.79 is also available as snap package, which is large in file, but bundles almost all required libraries. Available for Ubuntu 14.04, Ubuntu 16.04, and higher. Thomas Schiex’s PPA contains the Blender packages for Ubuntu 14.04, Ubuntu 16.04, Ubuntu 17.04. NOTE that Blender 2.79 is not ready in the PPA at the moment of writing. Be patient, it will be there in a few days. And to remove the PPA repository, launch “Software & Updates” utility and navigate to Other Software tab. 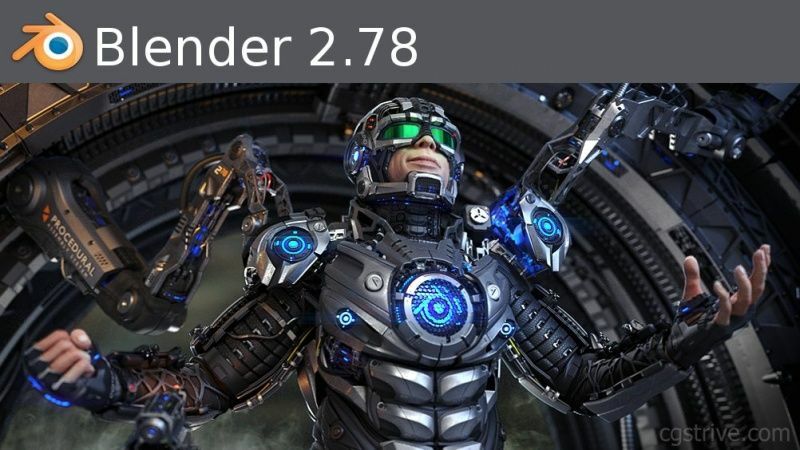 Blender 2.78b, a 2.78a release-compatible update was announced yesterday with important speedups, especially in Cycles and for Dependency graph. BLender 2.78b comes with Cycles Speedups that were announced last month. Most notable will be faster rendering of Motion blur with hair, which has a 5-10 time speedup – important for production rendering. Also there are various bug-fixes. Blender is now available as SNAP package, first install snapd via command sudo apt install snapd in terminal, then you’re able to search for and install blender-tpaw in Ubuntu Software. For those who don’t like the SNAP version, Blender 2.78b is also available in Thomas Schiex’s PPA, supports for Ubuntu 14.04, Ubuntu 16.04, Ubuntu 16.10, and derivatives. 2. 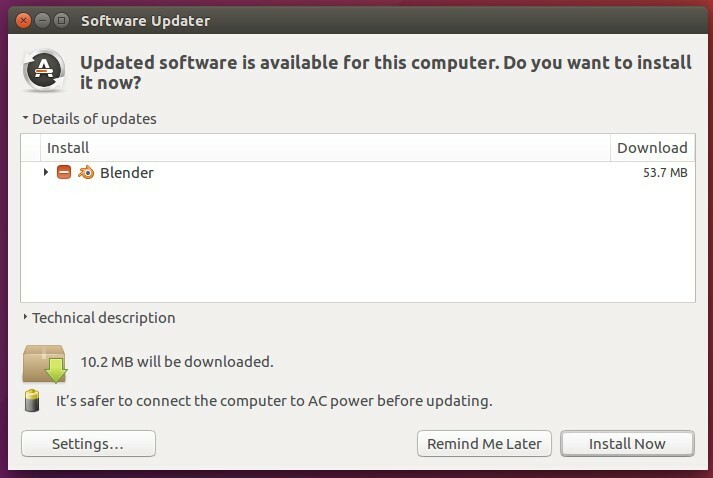 Then you can upgrade Blender from an existing version via Software Updater (or Update Manager) after checking for updates. 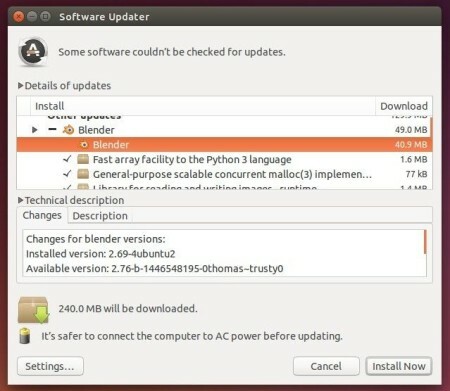 If you installed blender from PPA repository, run the following command in terminal to remove the PPA and downgrade Blender to the stock version available in Ubuntu main repositories. 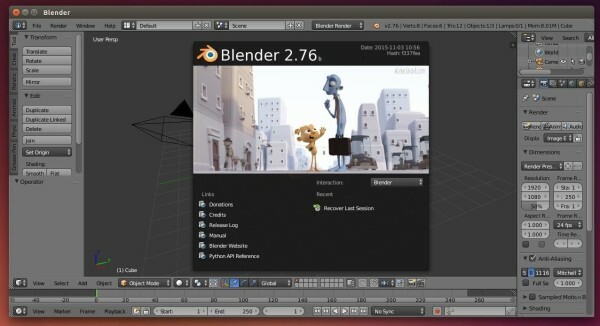 The Blender Foundation has recently announced the release of Blender 2.78. Here’s how to install or upgrade it via PPA in Ubuntu 16.04, Ubuntu 14.04, and Linux Mint 18, 17.
new physics capabilities, and various new add-ons. Thomas Schiex is maintaining a PPA with most recent Blender release for Ubuntu 16.10, Ubuntu 16.04, Ubuntu 14.04, and Linux Mint 17, 18. 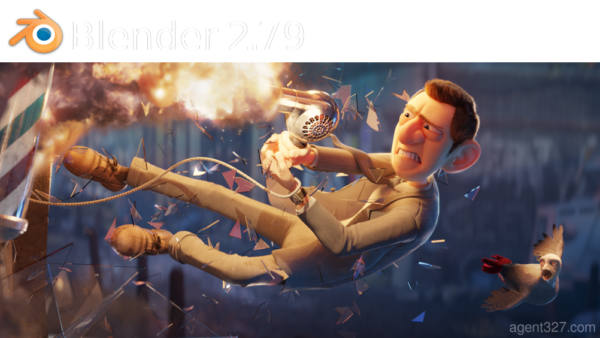 The Blender Foundation finally announced the stable release for Blender 2.77 this weekend. Cycles Rendering has better Subsurface Scattering, GPU support for Smoke/Fire and Point Density, and a few other features and optimizations. Support for Windows XP was removed, and the SCons build system too. And, as usual, a massive bug fixing! Read more at its features page. Blender 2.77 can be installed via either the official Linux binary, or a third-party PPA for better Ubuntu integration. 1. See this how-to to install blender via official Linux binary. Need to remove the previous installation first. 2. To install Blender 2.77 from PPA. There may be a little delay before the current release being made into PPA. Check out the PPA webpage, and read the PPA description before doing below steps. 2.) Then upgrade Blender by launching Software Updater. 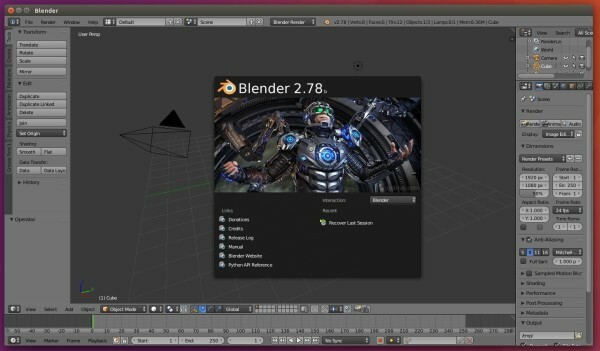 Blender, a professional free and open-source 3D graphics software, has reached the 2.76b release. The ‘b’ release brings a few bugfixes to the 2.76 release which was released a month ago. Besides installing from the official binary manually, you can install Blender and receive future updates using a PPA repository. Thomas Schiex is maintaining a PPA with latest Blender packages, support for Ubuntu 15.10 and Ubuntu 14.04 so far. Follow below steps to add PPA and install/upgrade Blender. NOTE: As an unofficial PPA, you may first check the PPA page for the current Blender packages and supported Ubuntu editions. Type your password when it asks (type in mind and hit enter, there’s no display when typing password). 2. If you have a previous installed via Ubuntu Software Center or PPA, launch Software Updater and upgrade Blender after checking for updates.